For other airlines, see Go Airlines (disambiguation). GoAir is a low-cost carrier based in Mumbai, India. It is owned by the Indian business conglomerate Wadia Group. In October 2017 it was the fifth largest airline in India with an 8.4% passenger market share. It commenced operations in November 2005 and operates a fleet of Airbus A320 aircraft in all economy configuration. As of April 2019, the airline operates over 230 daily flights to 28 destinations, including 24 domestic and 4 international destinations, from its hubs at Mumbai, Delhi, Bangalore, Kolkata and Kannur. GoAir was founded in Nov 2005 by Jehangir Wadia, son of Indian industrialist Nusli Wadia. The airline is a wholly owned subsidiary of the Wadia Group. GoAir commenced its operations using an Airbus A320 aircraft and operated its inaugural flight from Mumbai to Ahmedabad on 4 November 2005. The airline initially operated with a single aircraft to four destinations including Goa and Coimbatore with plans to induct 36 aircraft by 2008. In March 2008, the airline announced revised plans to operate 11 aircraft and service new destinations in North East and South India by the end of the year. But increasing fuel prices forced GoAir to cut down the existing number of flights in June 2008. The airline's growth has been slow compared to other airlines established at the same time such as IndiGo and SpiceJet, which have larger market share, fleet size and destinations served as of 2016. According to the airline, it is a planned strategy due to the tough aviation environment in India and to focus on maintaining profitability rather than on capturing market share and increasing the destinations and fleet size. As of February 2016, it remains the fifth largest carrier in the country with an 8% market share. The airline is planning for an Initial Public Offering (IPO) in 2016. The airline took delivery of its 20th aircraft in June 2016, making it eligible to operate international flights. The airline is headquartered in Mumbai, India. Jehangir Wadia has served as the Managing Director of the airline since its inception in November 2005. As of January 2019, GoAir operates to a network of 28 destinations - 24 domestic and 4 international flights to Thailand, Maldives, Muscat and Abu Dhabi. As of now, GoAir operates international flights from Mumbai, New Delhi, Bengaluru and Kannur. The airline has a total of 230 daily flights and approximately 1,600 weekly flights. The airline maintains hubs at Delhi, Kolkata, Bangalore, Kannur and Mumbai airports. As of March 2019, the fleet of GoAir consists of the following aircraft. In June 2011, GoAir placed an order for 72 Airbus A320neo aircraft worth ₹32,400 crore (US$4.5 billion). Deliveries began from 2016, with an induction rate of 12–15 aircraft per year. In December 2015, Airbus intimated that the deliveries will be delayed by three months due to technical issues and the aircraft will be delivered by the second quarter of financial year 2015–16. GoAir received its first A320neo aircraft on 1 June 2016. In July 2016, GoAir signed a memorandum of understanding with Airbus for 72 Airbus A320neo's aircraft valued at $7.7 billion, potentially taking the total number of orders to 144. This deal was announced at Farnborough Air Show 2016. Being a budget airline, GoAir does not provide complimentary meals on its flights but offers options for buy on board in-flight meals. The airline publishes an in-flight magazine named Go-getter. GoAir offers a premium service known as Go Business at a higher fare which provides extra services including seats with greater legroom, free meals, increased baggage allowance and priority boarding. In 2011, the airline launched its frequent flyer programme called Go Club, which provided benefits such as lounge access and free upgrade to Go Business. New membership was discontinued in February 2014. GoAir was rated as the "Best Domestic Airline For Excellence in Quality and Efficient Service" by Pacific Area Travel Writers Association in 2008. 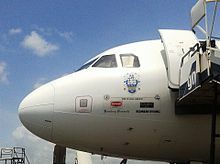 The airline was also awarded as the "Best Performing Airline" in Asia and Africa of all Airbus A320 operators by Airbus in 2011 based on fleet utilization and other performance metrics. ^ a b "GoAir-About". Archived from the original on 29 July 2017. ^ a b "ANNUAL REPORT 2016-17" (PDF). Official Website of GoAir. p. 8. Retrieved 16 May 2018. ^ a b "GoAir: About us". GoAir. Archived from the original on 23 March 2016. Retrieved 15 April 2016. ^ "GoAir begins commercial flights". The Economic Times. 4 November 2005. Retrieved 15 April 2016. ^ "GoAir to expand operations in South, Northeast". The Economic Times. 16 March 2008. Retrieved 15 April 2016. ^ Roy, Mithun (11 July 2008). "GoAir to drop 300 flights to reduce losses". The Economic Times. Retrieved 15 April 2016. ^ Roy, Mithun (5 January 2009). "British Air wants to buy 25% in GoAi". The Economic Times. Retrieved 15 April 2016. ^ Bhalla, Mohit; Chatterjee, Paramita (17 November 2009). "GoAir, SpiceJet deal enters air pocket". The Economic Times. Retrieved 15 April 2016. ^ "Air India, Kingfisher Airlines market share shrinks". The Economic Times. 17 May 2012. Retrieved 15 April 2016. ^ "IndiGo market share shrinks for 2nd month in a row in December". The Economic Times. 22 January 2014. Retrieved 15 April 2016. ^ Shah, Sneha; Singhal, Manisha; Vyas, Maulik (9 May 2013). "GoAir scouts for partners to sell 49% stake". The Economic Times. Retrieved 15 April 2016. ^ "What keeps GoAir up in the air". Rediff. 4 June 2015. Archived from the original on 24 April 2016. Retrieved 15 April 2016. ^ Mishra, Lalatendu (3 March 2013). "We will not sell under cost". The Hindu Business Line. Chennai, India. Archived from the original on 5 July 2014. Retrieved 15 April 2016. ^ a b "Stay small till customer has a need, not want: Jeh Wadia". Times of India. 16 February 2012. Retrieved 15 April 2016. ^ "GoAir awaits Airbus delivery schedule to decide IPO timing". Live Mint. 28 March 2016. Archived from the original on 18 April 2016. Retrieved 14 April 2016. ^ a b "GoAir takes delivery of its first Neo aircraft". Live Mint. 1 June 2016. Archived from the original on 5 June 2016. Retrieved 5 June 2016. ^ "GoAir: Contact Us". GoAir. Archived from the original on 23 March 2016. Retrieved 15 April 2016. ^ "GoAir : Destinations". GoAir. Archived from the original on 2 August 2017. Retrieved 16 April 2016. ^ Majumder, Arindam (13 July 2016). "GoAir readies foreign flight with IPO on mind". Business Standard. Archived from the original on 31 January 2017. Retrieved 18 January 2017. ^ "GoAir flies to Phuket, Male from Bengaluru". Economic Times. Retrieved 10 December 2018. ^ "GoAir to link Kannur with Abu Dhabi - Times of India". The Times of India. Retrieved 30 January 2019. ^ "About Us : GoAir". GoAir. Retrieved 1 September 2018. ^ "GoAir Fleet details". Airfleets Aviation. Retrieved 1 September 2018. ^ "GoAir orders 72 Airbus jets for Rs. 32,000 crore". Times of India. 17 June 2011. Archived from the original on 25 June 2016. Retrieved 16 April 2016. ^ "A320neo delivery to GoAir likely to be delayed". The Economic Times. 20 December 2015. Retrieved 16 April 2016. ^ "Business Standard - GoAir new order for 72 further NEO's". Archived from the original on 15 July 2016. ^ "GoAir Menu". GoAir. Archived from the original on 23 April 2016. Retrieved 16 April 2016. ^ "Go Getter In-flight magazine". GoAir. Archived from the original on 24 March 2016. Retrieved 16 April 2016. ^ "Go Business". GoAir. Archived from the original on 24 March 2016. Retrieved 16 April 2016. ^ Phadnis, Aneesh (11 December 2011). "GoAir flies on new routes to lure passengers". Business Standard. Archived from the original on 4 August 2016. Retrieved 5 June 2016. ^ Hill, Ruben (27 April 2016). "GoAir Frequent Flyer Program". ISP online. Archived from the original on 23 September 2016. Retrieved 5 June 2016. ^ "PATWA International Awards" (PDF). PATWA. Archived (PDF) from the original on 24 April 2016. Retrieved 30 March 2013. ^ "GoAir ranked the Best Performing Airline by Airbus". Breaking Travel News. 1 June 2011. Archived from the original on 20 December 2013. Retrieved 30 March 2013.